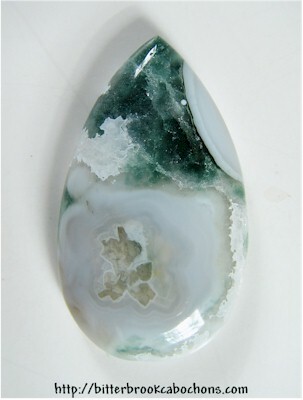 This Ocean Jasper teardrop came out "different:" the dark green background and the white area around the cab both sparkle. This speciman has big flowers for orbs, and you can see where I just started to cut into one at lower center front. 35mm x 20mm x 6mm. Weight: 34.75 carats.